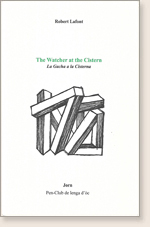 The Watcher at the Cistern, written in less than a year and published in 1998, represents the synthesis and the pinnacle of Robert Lafont's works, which it sums up and completes, gathering together the majority of topics scattered through his literary and scientific works, in the form of a legend of the ages mixed with georgics. This long epic and didactic poem, recalling at once Hesiod, Lucretius, Virgil, Dante, Milton, and Hugo (a non-exhaustive list), is unique among contemporary poetry, standing out almost provocatively against current trends, in particular by its regular, strict form, which obeys all the rules of classical versification. The Watcher at the Cistern is a threefold trip, a threefold recapitulation of the history of mankind, each time from a different point of view. The first canto settles scores with the many gods of the pagans as well as the only God of monotheist religions. The second canto magnifies human labour and opens with the georgic celebration of the Mediterranean trinity, bread, wine and olive, at the root of a whole civilization transcending frontiers. The third canto finally depicts the spaces beloved of the poet, starting with the banks of the river Gardon where he first knew nature and love. Then comes an extollment of that special space which is the female world, with the evocation of the Troubadours' fin' amor on the one hand, and of the detestation of woman, "the infernal Eve", peculiar to religious obscurantism. In a gradual widening, the poem depicts the maritime space, then the conquest of sky and cosmos, to end on a Pascalian vision of the infinite which brings us back to our finiteness. In this book, Lafont, who never stopped honing and improving his writing, is at the height of his style as an Occitan writer. After exploring various poetic trends of the twentieth century (though without following the post-1950 fashion for extreme destructuration of the sentence), the poet chooses a metric whose regular rhythm has an incantatory quality. The strong music of many verses arouses a long echo in the reader's mind, and I am confident that most of this is still apparent in this English version so carefully elaborated by Marie-Christine Rixte, Louise Esher and Peter Ricketts. This is surely one of the very few translations from Occitan that meets with current standards of translation, in terms of fidelity and literary quality.